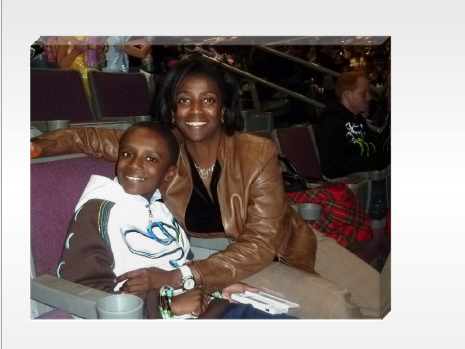 Last year, my son and I went to a "Disney on Ice" show and we both had a wonderful time. Since I had my camera out, someone we were sitting behind asked me if I wanted her to take our photo. I said sure, thinking the photo probably would not turn out that well or capture all the fun we were having. Boy was I wrong. I fell in love with that photo because it showed not only the fun of the moment but also captured my son in that in between time of being a kid and a young man where going to see "Disney on Ice" with mom is still fun and exciting. So when I was asked to review a product called Easy Canvas Prints, I knew exactly which photo I wanted to have put on an 11"x14" canvas on the wall of my home. Easy Canvas Prints can turn your photo images into works of art on canvas. Using the Easy Canvas Prints website, you can upload your photo and create a personalized print on canvas in small, medium, and large canvas sizes. The border choices give you different ways for your canvas to blend or contrast with your home decor. I choose the mirror image border as shown above so that my canvas image looks the same when viewed from different angles. 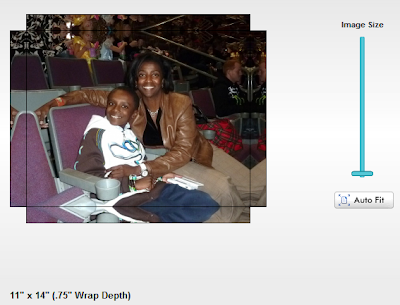 Another option offered is the ability to zoom in and out on the photo. I choose to zoom in so that the canvas would show less of the stadium seating in the background. The whole process of uploading the photo, choosing the options and placing the order was very easy and only took me about 10 minutes from beginning to end. The retail price of the 11"x14" canvas that I ordered was around $60. But, when I ordered my canvas, I also signed up for them to email me their specials and Easy Canvas Prints has some very good discounts including 40% off canvases with FREE shipping, BOGO FREE canvases, and FREE canvases in smaller sizes. Go over and "like" the Easy Canvas Prints Facebook Page to get 50% off and FREE shipping on your order. HOLLA! My canvas turned out great and now my special moment is a work on art on my wall. So if you are looking for a very easy way to turn your prints into works of art on canvas, take a look at Easy Canvas Prints. Disclosure: I was offered a complimentary 11"x14" canvas from Easy Canvas Prints so that I could try out the service and write this review. I was not compensated in any other way. All opinions are my own.